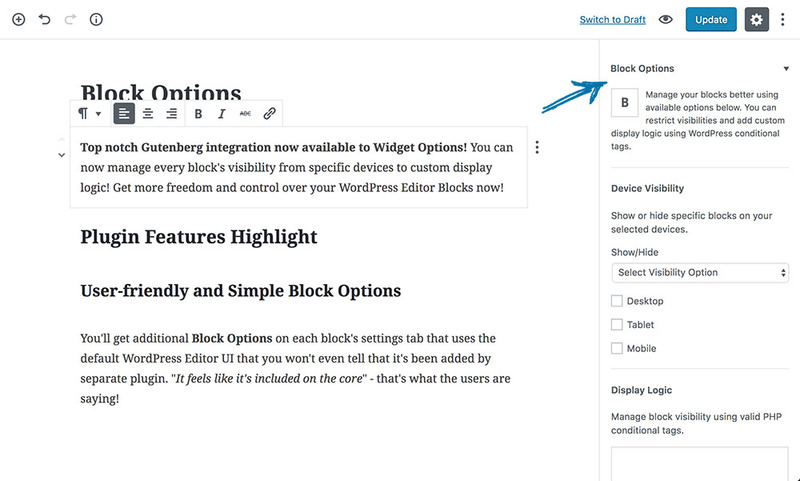 Top notch Gutenberg integration now available with Block Options! You can now manage every block’s visibility from specific devices to custom display logic! 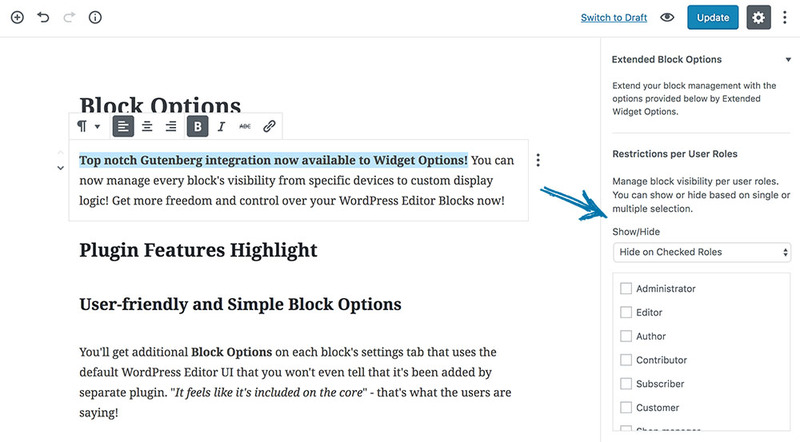 Get more freedom and control over your WordPress Editor Blocks now! 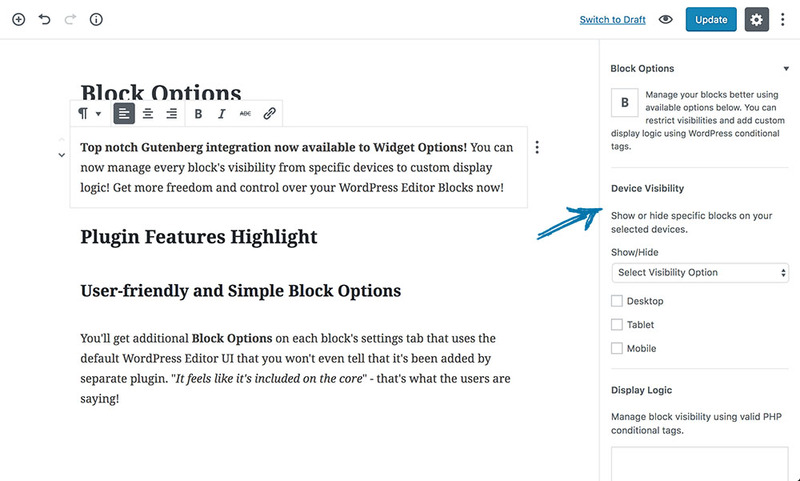 You’ll get additional Block Options on each block’s settings tab which uses the default WordPress Editor UI that you won’t even tell that it’s been added by separate plugin. “It feels like it’s included on the core” – that’s what the users are saying! 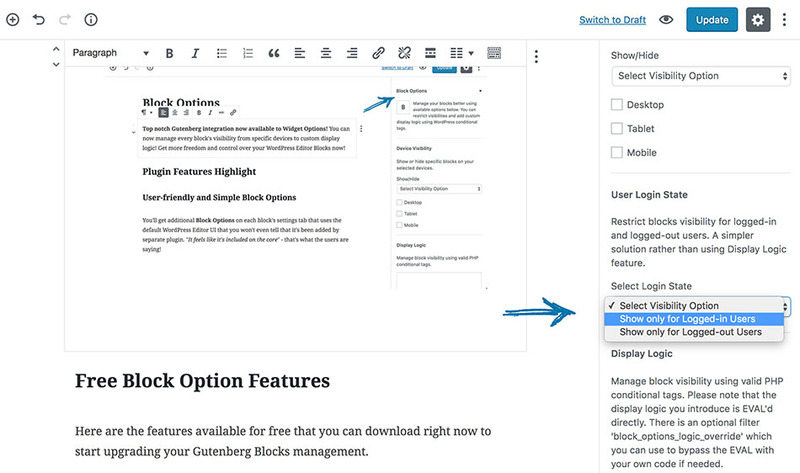 Here are the features available for free that you can download right now to start upgrading your Gutenberg Blocks management. Optimize your contents! 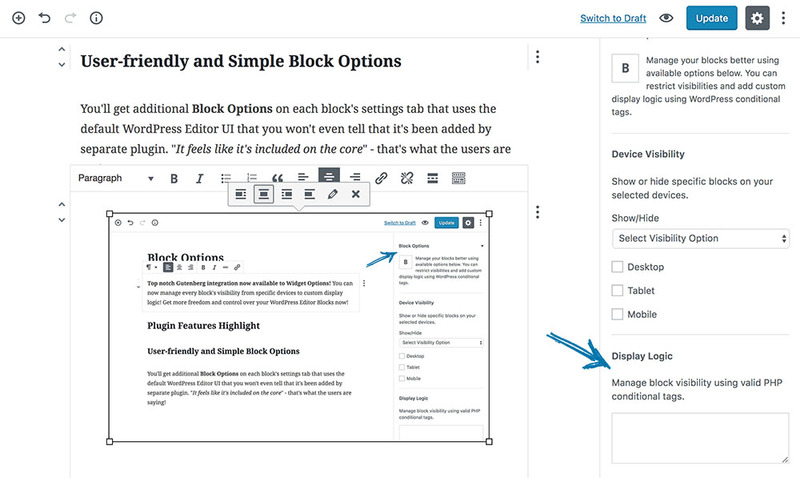 Show or hide any WordPress Editor Blocks on mobile devices, tablets and even desktops. This feature will give you the option to target your customers based on the devices they are using. If done right, you can increase your user engagement and conversion rate. 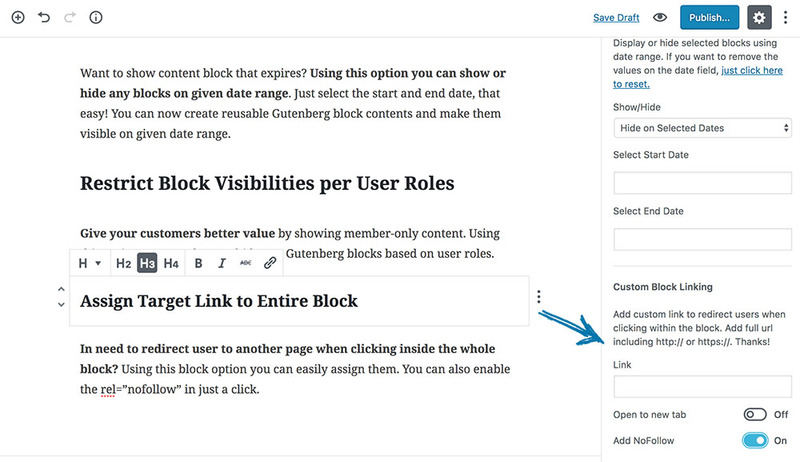 Similar to display widget logic, this block option will give you the ability to show or hide any Editor Blocks using WordPress standard conditional tags. For example you can use has_tag() to manage visibility when the post has the specified tags. There are lots of possibilities that you can achieve, especially when you are comfortable with creating your own PHP conditional tags. Easily show any blocks on logged-in or logged-out users only. This option will give you better management specially when you are running a membership site. Upgrade to extended version to have more block management options. Give your customers better value by showing member-only contents. 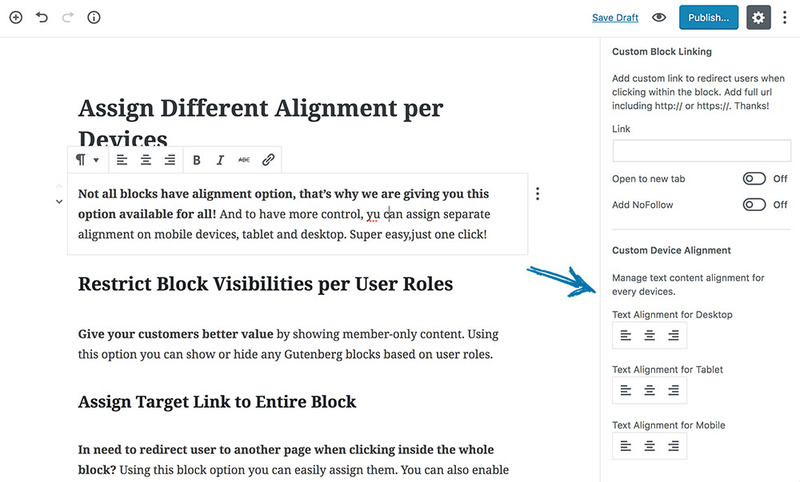 Using this option you can show or hide any Gutenberg blocks based on user roles. Easily manage WordPress Editor blocks visibilities per day/s via checkbox. Give better user experience by restricting several contents on your shop when you’re business is closed. Or create blocks that you want to promote on a specific day in a week. Want to show content block that expires? Using this option you can show or hide any blocks on a given date range. Just select the start and end date, that easy! 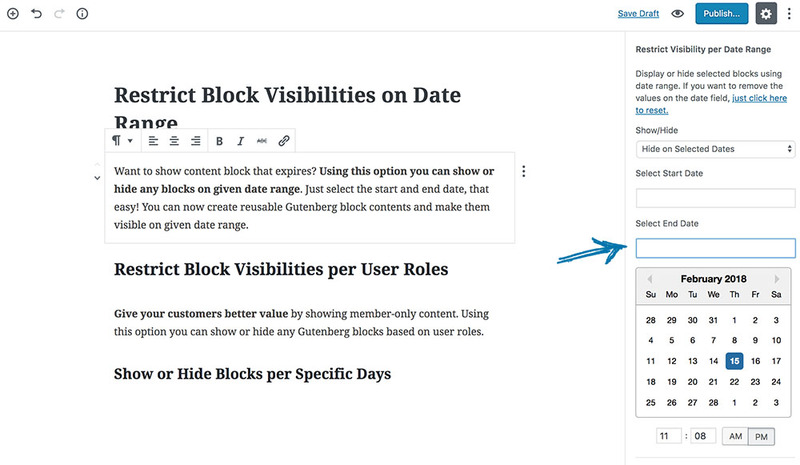 You can now create reusable Gutenberg block contents and make them visible on a given date range. In need to redirect user to another page when clicking inside the whole block? Using this block option you can easily assign them. You can also enable the rel=”nofollow” in just a click. Not all blocks have alignment option. That’s why we are giving you this option available for all! And to have more control, you can assign separate alignment on mobile devices, tablets and desktops. Super easy,just one click! Get notified when Extended Block Options is available!